If you were a child in Sparta, you would have to be strong, blessed with excellent genetics or a fast learner. Spartan children had a responsibility placed upon them at birth, to serve Sparta, and in order to serve Sparta, you had to be strong and learn fast. The Spartan government was only interested in the best for its state, which meant that strong children were the only ones that would survive. Both baby girls and boys were put through initial tests to see if they were strong enough to be useful to the state. If a child did not pass these fitness or health tests, they would be left to die, outside of main living area of the state, typically in the wild, or in the mountains. Sparta was not a state to accept anything but the best, and this practise started at a young age. The seriousness of these traditions was held in high regard, and all Spartan children would be checked. The Spartan elders were fastidious and regimented in their appraisal of the Spartan young. Elders would go so far as to wash a baby boy in wine, believing it would harden and strengthen the young one, to ensure they would grow to be in line with the requirements the state needed to ensure ongoing strength. The treatment of boys and girls in Sparta was different, but they shared many similarities, something other Greek states could not. The Spartan way of life required that both boys and girls be strong, powerful and capable. Education of the mind and body was deemed important for both sexes, and the Spartan girls and boys would have the opportunity to prove themselves worthy of membership. Spartan girls like the boys would live with their parents up until the age of six or seven, after that they would be required to attend a school of sorts. This attitude of educating girls was something rather unique about Sparta, but the girls would live, sleep and exercise in their own living quarters. While in this stage the Spartan girls would have to learn many things, and while documentation about exactly what Spartan girls would learn is rare, it’s commonly thought that their education was almost an equal to that of the boys. Subjects they would study included poetry, history, drama, reading and writing, music and art among other subjects and would provide them with enough knowledge to give them a position no other woman in Greece would experience at the time. Just like the boys, Spartan girls would be expected to be physically fit. A healthy woman would give birth to healthy babies, which when you think about it makes perfect sense, and the Spartans lived by this. The young Spartan girls would be allowed to exercise publicly outside with the Spartan boys, another rarity in ancient Greece, where most girls were not allowed even outside unless performing a chore or some description. Spartan girls would even learn combat, how to fight, wrestle and even gymnastic training, all of which would prepare them suitably should they ever need to defend themselves or Sparta. The next test in life for Spartan girls would occur when they turned 18, and their physical training would be key to them succeeding. At this age, Spartan girls would be tested for citizenship, it’s thought that this test was a mix of physical testing and mental testing, and allowed them to prove their worth and is successful become a citizen of Sparta. If the girl would fail her test, then she would not qualify to become a citizen and would be marked as middle class, which the Spartans would refer to as perioikos. One a Spartan girl had passed her test, she was now a woman and all the benefits that were afforded to her from this were now available. Once the boys had proved themselves to be fit to survive, they had much hardship ahead of them, but all with the purpose of ensuring the combined strength of Sparta. Up until the age of six to seven the Spartan boys would live with their parents, or their mother and maid, but all the while they would have the importance of the state of Sparta drummed into their psyche. Once they left home the Spartan boys would join the public education of the state, or their military training, and become part of the Agoge which was a Spartan method for instilling the values of Sparta in their future warriors. It was here that they will live in shared quarters, and assigned to a group. The education would be structured based on age, with the first stage running from 6/7 to 17, and then from 17 to 20, even after 20 the eduction would continue, to age 29/30 where a Spartan and earn more freedom and rights as a citizen. In the first state the Spartan boys would move into their barracks, where they would live with other Spartan boys of the same age, their new home would be simple and sparse. In the second stage the Spartan boys would now become reserve members of the army of the state, however still not classes as men, they would only be called to battle in needed situations. There was also other opportunities at this age for the Spartan boys included being assigned to a special guard of secret police in the Spartan state. 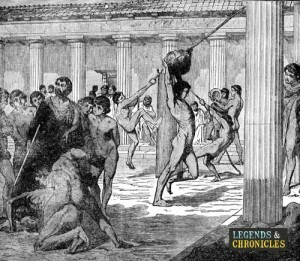 The third stage would now begin at age 20, the Spartan boys would be voted into one of the existing public messes, and the existing members would control who would enter their mess. It is believed that the boys would have the next ten years to earn acceptance into one of the available messes. Life for a child in ancient Sparta was not easy, you would be expected to be strong from birth, otherwise you would not make it. For those that did survive, life would continue to be tough, but at the end of your training, boy or girl, you would be a physically strong, mentally strong member of one of the most powerful states in the ancient world.